Description: Q CHILAC6-06 With BNSF 7525, BNSF 7245, BNSF 7803, & BNSF 7387 with 82 Loads, 8101 Tons, 7973 Feet. Photographed at 11:40. Description: Eastbound stack train blasts past the depot in Carrollton Missouri. Description: This Z-train had a locomotive fail en-route, and so it was set out, and continued over the pass with just two units up front. It struggled! Here, 7387 east crosses over itself as it dodges rain showers and climbs through the Loop itself. Description: BNSF 7387 and kin drop downgrade between Tunnel 2 and Tunnel 1 amidst lifting fog and dawn light. Title: BNSF 7387 Runs Dpu. Description: The lead unit of the baretable appaoches on the right, overtaking the downhill stacker in the middle. Description: BNSF 7387 at lead with BNSF 7536 in what seems like a light pulling pair (normally triplets) on a coal drag waiting to come through Vancouver, waiting along the elevated track/via duct along Vancouvers south side. Description: 23K doubles onto the rear half of his train before departing west. Description: Train #205 approaches the passenger station and under the new, but not yet in service signal bridge at Shirley,Mass. 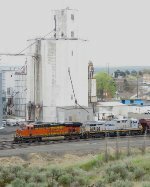 Description: BNSF 7387 - CREX 1409 double-header on northbound covered hopper group under the Connell elevator and blah-white skies (what? A giant white grain elevator against a blah-white sky doesnt show up? Who would of thought). Description: BNSF 7387 leads this empty sand train west on the BNSF Marceline Sub. as it leaves Ethel, Mo. Title: BNSF 7387 Leans into the curve with a sand train.